Let’s assume that the Haslams don’t fire Hue Jackson, the coaching staff, and the front office during or after the upcoming season. It goes against type, I know, but bear with me here. Let’s assume we won’t have yet another new crew of decision-makers coming in to clear out the roster to make room for their supposed mold of players. That is, the Danny Shelton trade — offloading a first-round nose tackle ill-suited to the current defensive scheme for nominal consideration — is the last of its type for a good long while. Let’s take the moves we’ve seen from John Dorsey as evidence that he intends to set the Browns up to both leap forward drastically in 2018 and prepare a core nucleus for sustained success in the coming years. In light of the latter, the ouster of last year’s best cornerback, 30-year-old Jason McCourty, makes somewhat more sense. Note that all but one of his acquisitions this offseason have been for players in their mid-20s. Despite cap space aplenty, they restrained themselves from reaching too much replace LT Joe Thomas with unrestricted free agent Nate Solder, who turns 29 next month and got a guaranteed $35 million from the Giants. Note also that among all of the wheeling and dealing so far, the Browns have kept in tact their first five draft picks in the Rounds 1 and 2. Expect those players to be integral to that nucleus, since they’ll be under team control for four years with affordable rookie contracts. With the caveat that, obviously, you play one season — indeed one game — at a time, let’s see how the Browns’ current situation positions them for three years out, the 2020 season. From that perspective we can evaluate priorities for contract extensions and use of draft capital. In other words, who’s already slated to be on board at the turn of the next decade? Who among today’s Browns should we consider investing in for the long term. At what positions does it make the most sense to bolster the depth chart with fresh young talent? We’ll look at the offense now and tackle the defense in an upcoming post. Taylor has one year left on his deal. The Browns balk at the phrase “bridge quarterback,” but the odds are strong (to the extent we can ever say this about the Cleveland QB situation) that the 2020 starter will be the first overall pick of the 2018 draft. They may even double up on QBs with a later pick. Not to totally close the door on new deal for Taylor if he lights it up this year, but having a franchise quarterback in place who doesn’t chow up $20-plus million per year in cap space is a pretty good strategy if it works out. Low-ceiling backups Cody Kessler and Kevin Hogan will both be long gone by 2020. Carlos Hyde is in the fold through 2020 if his health and productivity merit $5 million for that season. Beyond him it gets very interesting. Duke Johnson is a proven and durable weapon out of the backfield, not missing a game his first three years. If they invest in extending his contract now, a year removed from his hitting the market, it clarifies their draft priorities. Put another way, I can’t see them paying both Hyde and Duke big bucks, then drafting Saquon Barkley fourth overall. But if Duke and the Browns don’t come to terms before the draft, Barkley is a possibility. 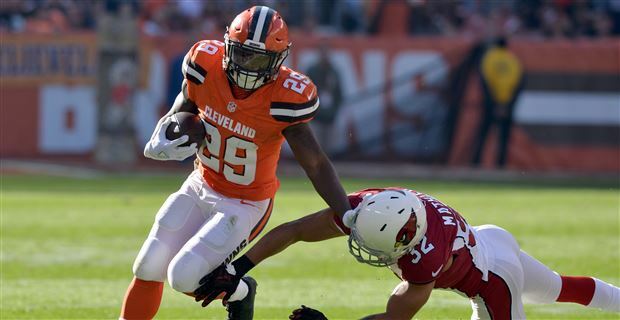 More likely, given their other needs, is that the Browns spend a later pick to add to their stable, which also includes 2017 seventh-rounder Matthew Dayes and Darius Jackson, last year’s waiver pickup who spent the season on IR. As with the QBs, the Browns currently have no wideouts under contract through 2020. That could and should change soon. Incoming star slot man Jarvis Landry signed his franchise tag in Miami so they could trade him to some team offering long-term security. He’s averaged 100 catches a year in his first four years. He will turn 28 in November 2020. Corey Coleman, the 2016 first-rounder, would remain under team control for 2020 in the unlikely event the Browns pick up his fifth-year option after the upcoming season. While I’m rooting for him to develop better route-running and hands to go along with his natural speed, I’m also skeptical of his reliability. After sustaining hand fractures each of last two years, this season is truly make-or-break for him. The Browns have seven other WRs on the roster right now, including 2016 draftees Ricardo Louis and Rashard Higgins. None of the them screams long-term keeper. But that’s not to say that bringing back UFA Terrelle Pryor makes much sense, much as Hue may be smitten with him. He turns 29 in June and probably wants the kind of coin that Landry deserves and that the Browns would better keep available for Gordon or others. Don’t be surprised to see the Browns select a receiver with one of their three second-rounders this spring. Ninth time’s a charm, right? Cleveland seems in good shape here, with David Njoku showing plenty of promise as a receiver and downfield mismatch threat. One of their three first-round picks last year, his contract is fully guaranteed through 2020, when he’ll still be just 24 year old. The oldest offensive player on the roster is now Darren Fells, 31, freshly signed in UFA to a three-year deal. He’s a big man filling a big need: a tight end who can block. He also has hoops skills to bring to bear as a pass catcher. It’s not a super expensive contract, and the cap implications if it doesn’t work out down the road are manageable. Seth DeValve has two more years on his rookie deal, and three other TEs with multi-season NFL experience round out today’s roster. Figure the Browns to pass on this position in the 2018 draft unless someone truly stands out as their BPA on Day 3. LG Joel Bitonio, signed through 2022. His 2017 extension was structured to leave the Browns with basically no dead cap hit if they need to release him after 2018, If he merits the healthy annual salaries, all’s the better. RT Chris Hubbard, recently signed via UFA through 2022. For now they also have versatile holdover Spencer Drango and a few other backup and developmental players. The Browns may consider this unit set for this season, but you never stop evaluating from within and without. Will Coleman make the switch effectively and be able to protect the blind side? That’s the biggest question, and the answer will dictate how the Browns proceed a year from now. Running back (higher if Johnson is not extended). This entry was posted in the team today and tagged draft, front office on March 21, 2018 by Dave Algase.